The Common Size of a Sideshow Banners? In the golden days of sideshows (correct that sideshow was a term that was for ten in one live shows) all of the other shows on carnivals and circuses (there were several THOUSAND SHOWS OF ALL TYPES) WERE CALLED BY THEIR ATTRACTION TYPE: girl show, posing show, jig show, revue, wild animal show, motordrome, illusion show, etc, etc.. Reference: Volume one, "Pictorial History Of The American Carnival" by Joe Mckennon. Regarding banners on sideshows. Many acts who were unique, such as one of a kind freaks or unusual working acts.......would often carry their own banner as they moved from one show to another. 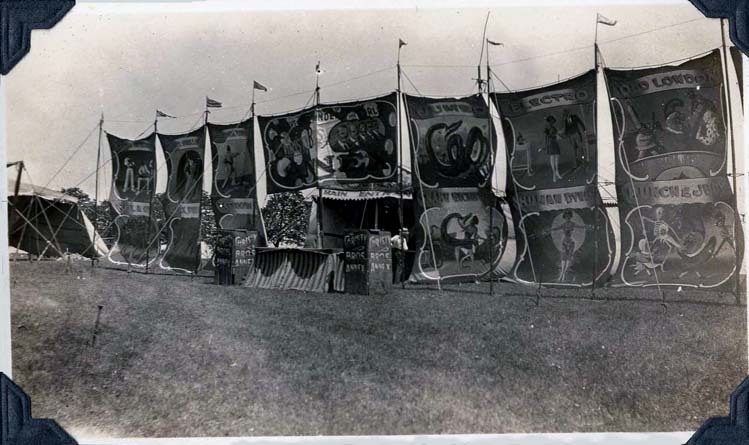 Therefore the sideshows pretty well kept to a standard size which was ten feet wide by eight feet high. Today since there are so very few ten in one shows, and space available is premium, there is no longer a standard size. Rule of promotion: use a banner big enough so it will catch the attention of the passerby potential customer, that can be easily seen and understood at a reasonable distance, Just bear in mind the banner is your poster that must convince the passerby to part with their money to view your attraction.